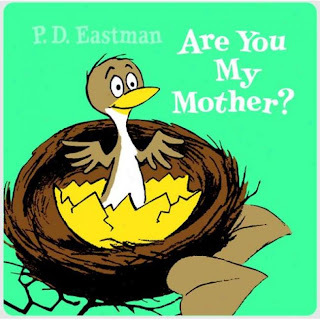 “Are you my mother?” That was the question asked by one of our kids’ favorite characters, in the book of the same name by P.D. Eastman. The Beginning Reader book was first published in 1960, long enough ago to have been one of my favorite picture books as a kid, too. This morning, we discovered how much that baby and the mother he finds by story’s end were drawn from real life. A few weeks ago, we noticed a fat mama robin dipping in under the roof of our back porch, carrying bits of dry grass and twigs in her beak. We watched her from the window by our kitchen sink, and saw that she was building a nest on the curling top of our toboggan, which we’d set upright against the wall but hadn’t yet put away for the season. At first she fluttered off the nest every time one of us stepped up to the window. But she seemed to decide that she could live with our occasional presence, as well as the occasional kitchen light shining out on her in the darkness. Despite such a wet spring, her nest stayed dry under the porch’s roof. Jim looked out from the sink early this morning and saw something new: papa bird standing on the side of the nest, an earthworm dangling from his beak. Father passed the worm to mother, who bent over and lowered it just as the tiny open beak of a chick popped up to meet it. As the baby bobbed up and down more insistently, Jim saw its head, still dark and wet — plus spiky feathers on top and a scrawny neck that, honest-to-god, was the spitting image of Eastman’s baby bird. It was easy to get the kids up when we told them the first robin had hatched. We couldn’t watch his ungainly movements without laughing. Now three small chicks crowd their nest and keep their parents busy feeding them. P.D. Eastman, clearly, had been a close observer of this particular rite of spring. We’re grateful to have had the chance, too. - Learn more about the P.D. Eastman book, Are You My Mother? - Watch a YouTube video reading of the book. 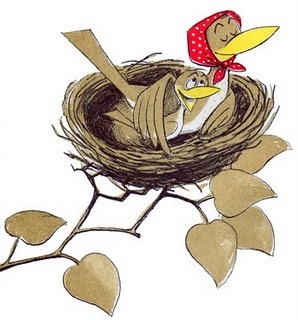 - Watch a YouTube video of robins feeding their hatchlings.